05.27.10 In a dramatic playoff game at the U.S. 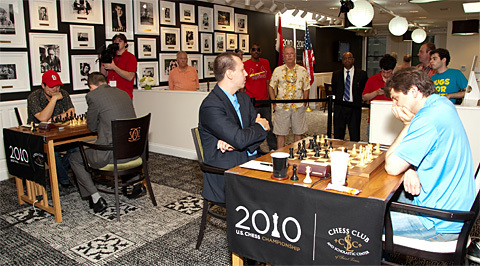 Chess Championship played at the Chess Club and Scholastic Center of St. Louis, Gata Kamsky held Yuri Shulman to a draw and thus won the title of U.S. Chess Champion. Both players bid on their preferred time for the final tiebreaking game. The lowest bidder received choice of color and draw odds. Kamsky bid 25 minutes to his opponent's 60, took black, draw odds and the title. The final game in the U.S. Chess Championship between Yuri Shulman (left) and Gata Kamsky. 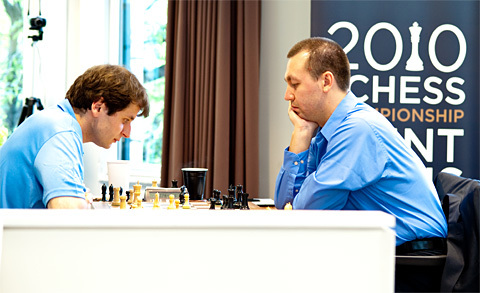 Kamsky held Shulman to a draw and was named 2010 U.S. Champion. What began as a twenty-four player field including all Grandmasters but three was wittled down to the top four scorers playing in a round robin style playoff to decide the championship. Advancing to the final round were: Defending U.S. Champion Hikaru Nakamura, 2008 U.S. Champion Yuri Shulman, 1991 U.S. Champion Gata Kamsky and 2006 U.S. Champion Alexander Onischuk. In a suprise turn of events, Nakamura dropped his game to Shulman and Onischuk, after declining Kamsky's draw offer, proceeded to lose. That set the stage for a Shulman-Kamsky final round. In a peculiar system for determining colors and time control for the final game, both players bid on their preferred time. The lowest bidder gets to choose color and receives draw odds (i.e, the player with draw odds only needs a draw to win). 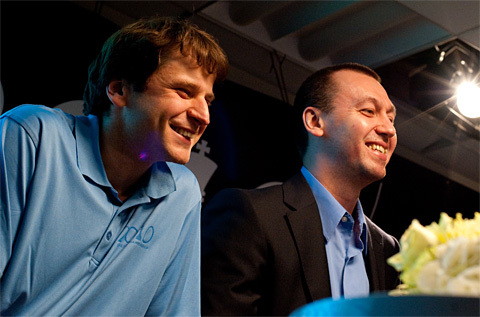 That player was Kamsky and he went on to hold Shulman to a draw to claim the title of 2010 U.S. Chess Champion. The four-player round robin underway at the Chess Club and Scholastic Center of St Louis. The finalists at the press conference following the championship game.